With less than two weeks to go until the special election in the 34th Congressional District, candidate Robert Lee Ahn has staked the position of outsider in the race to succeed now-State Attorney General Xavier Becerra. Assemblymember Jimmy Gomez has garnered the bulk of the endorsements from the Democratic Party hierarchy, including Mayor Eric Garcetti and Becerra himself, who stepped down earlier this year. 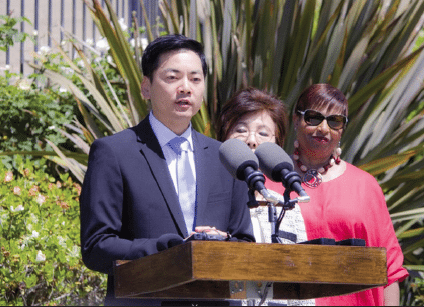 But Ahn said he is counting on grassroots support, including voters from the historic Asian American neighborhoods of Koreatown, Chinatown, Filipinotown and Little Tokyo. In a small-turnout election, he said that may make the difference. Ahn is an attorney and serves on the Los Angeles City Planning Commission. The special election takes place on Tuesday, June 6. “I’ve been doing meet and greets from Koreatown to Little Tokyo, and all throughout Downtown, Eagle Rock and Boyle Heights,” Ahn said. “There are a lot of people frustrated with their elected officials and with government in general. The same politicians that we put in office time and time again, they are beholden to special interests. If elected, Ahn would be just the second Korean American elected to the U.S. House of Representatives. Kim Yamasaki, executive director of Center for Asian Americans United for Self Empowerment (CAUSE), said both candidates face challenges engaging the Asian Pacific American community. CAUSE is a nonpartisan organization dedicated to the political and civic empowerment of Asian Pacific Americans. “Candidates are going to have to work hard for the APA vote,” Yamasaki said, noting that her organization has volunteers working for both campaigns. In early absentee ballot returns, the Asian vote is currently outpacing the Latino vote 5,503 to 3,619, as of May 24. Ahn cited 12-cent gas tax hike, signed into law by Gov. Jerry Brown, as an example of a political class that is out of touch with the concerns of the working class. “That’s a huge jump especially for poor people. The real travesty is we already pay a 38-cent gas tax. What’s happening to the 38 cents that is already being paid that is supposed to go to infrastructure? That’s the problem I have. There should be accountability,” Ahn said. “I’m the candidate who is truly powered by the people, so when I get into office I can truly work on behalf of he people. In the media narrative that has been played out as a Latino vs. Asian candidate, but this really is an insider versus an outsider,” Ahn said. Early voting is currently under way at three Los Angeles locations: Arroyo Seco Library, 6145 N. Figueroa St.; Puente Learning Center, 501 S. Boyle Ave.; and Pio Pico Library, 694 S. Oxford Ave. For more information, visit https://lavote.net. The 34th District represents all of Koreatown, Chinatown, Little Tokyo, and Little Bangladesh, as well as parts of Historic Filipinotown, Hollywood, Hancock Park, Downtown, Eagle Rock, Boyle Heights, City Terrace, Echo Park, El Sereno, Glassell Park, Highland Park, Lincoln Heights, Mt. Washington, Montecito Heights, and Westlake/Pico Union.